Bharti Airtel is a name to reckon with in the Indian telecom sector. Airtel continues to lead the sector with 29.80% market share after adding another million subscribers to its fold in the month of September 2017, as per COAI data. Their total subscriber base during the said month was at 282.04 million which was phenomenal considering the various challenges being faced by the sector and the stiff competition in this space. Airtel conceptualized the My Airtel App to provide their customers a single app to manage all their accounts from, be it prepaid, postpaid, digital TV or broadband. While the app had everything going for it such as a top-notch user interface and a seamless user experience, there was one major challenge for which our expertise was sought - achieving higher rankings for this new app in the app store. A comprehensive planning was at the core of the results we wanted to achieve for the My Airtel App in the competitive app store ecosystem. Our ASO experts identified the most relevant keywords that Airtel’s customers might use to get to the app and worked towards making the My Airtel App rank higher on these keyword searches. We then suggested making changes to the App description, main description, title and other on-app elements. We continuously monitored the effect and recommended tweaks, based on ranking changes and feature additions in the app. We aggressively promoted the app through various off app activities and strengthened authority for the app. We worked to increase the presence and mentions of app across the web. These activities contributed towards higher authority and popularity which ultimately boosted the rankings in the Google Play and Apple Stores. We monitored the feedback and reviews given by users on the Play Store and suggested improvement, modifications and feature additions in the app accordingly. There were about 10 versions launched between Apr 2017 to December 2017, improving the app performance and overall experience, along with having regular feature additions. So, with new downloads, more of 4 and 5-star ratings or reviews were given by user. Overall rating of the app also increased. Our team managed to deliver incredible improvements in keyword rankings from the time when they took over. Highly competitive keywords like “online recharge app”, broadband bill pay, “payments bank” were ranking #1 and online recharge at #3, in the month of December 2017. Some other strategically high value key phrases like “bill payment”, “mobile recharge app”, “payment app”, “easy money transfer”, online payment, mobile recharge offers, etc. also managed to break in the top 10 results by December 2017. We were also able to sustain the rankings with brand keywords and bring them all ranking at #1. 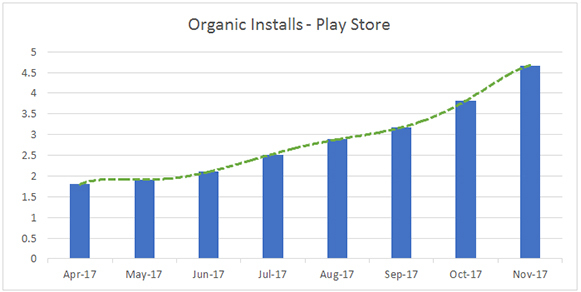 As a result, monthly organic installation of the app rose by 159% between April 2017 and November 2017. NOTE: The absolute numbers are indexed, with Apr. ‘17 set equal to 1.8, for Organic Installs, to facilitate the comparison of growth. Another positive indicator came from a comparison we did of the overall reviews of the My Airtel App. It was found that the app registered a 60% increase in total number of reviews between April-December 2017. During the same period, the number for 5-star ratings increased by 68%. As a result, the overall rating of the app increased from 4.3 in April 2017 to 4.4 in December 2017.